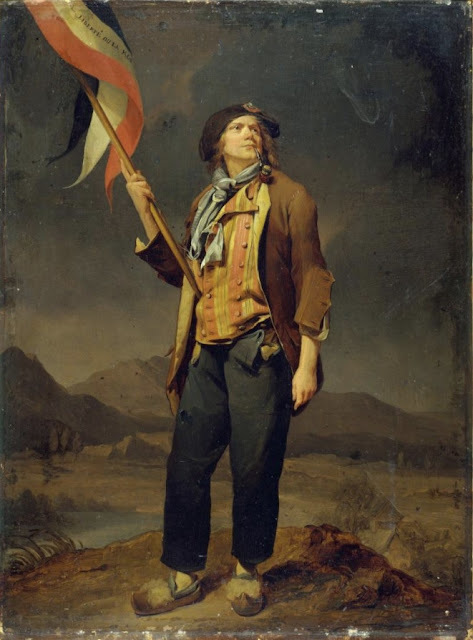 Here is another, equally iconic painting by Boilly from the Revolutionary era, now in the Musée Carnavalet. It comes as a bit of a disappointment to learn that this famous heroic image does not depict a real sans-culotte at all, but the actor and singer Simon Chenard. The occasion was a festival held in Chambéry in October 1792 to celebrate the new Republic's military victory in the Savoy. Chenard presumably featured a the performer of patriotic war songs such as the "Hymn of the Marseillaise" which the Convention decreed was to be sung at the celebration. Susan Siegfried comments that the picture resembles a fashion plate, and at one level, functioned as such. (p.41-2) Chenard personifies the ideal of the Citizen Soldier, with his improvised army uniform over his working clothes. (I particularly like the strange fluffy clogs..) He carries the new national symbol, the tricolour flag inscribed with "La Liberté ou La Mort". The figure appears as though on a stage, with a fictionalised backdrop of the victory in the Savoy. With his fine baritone voice, Simon Chenard was one of the most popular actors and singers of the day. He was born in Auxerre in 1758, and first earned fame in Paris in 1782 in the role of Orestes in Gluck's opera Iphigénie en Tauride. In 1783 he joined the Comédie-Italienne (later the Opéra-Comique) and performed with the company until 1823. 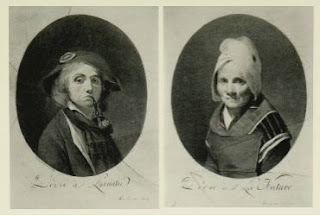 He was one of Boilly's closest friends, living at the same address; when Boilly's first wife died in 1795 he appointed Chenard as guardian of his five children. 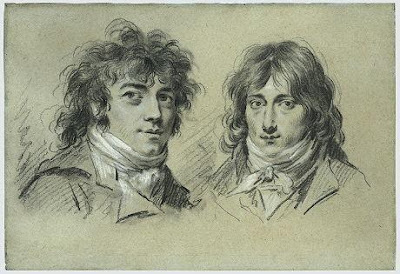 Their circle included the artists Gérard, Prud'hon and Isabey: Chenard was an avid collector of their paintings and drawings. 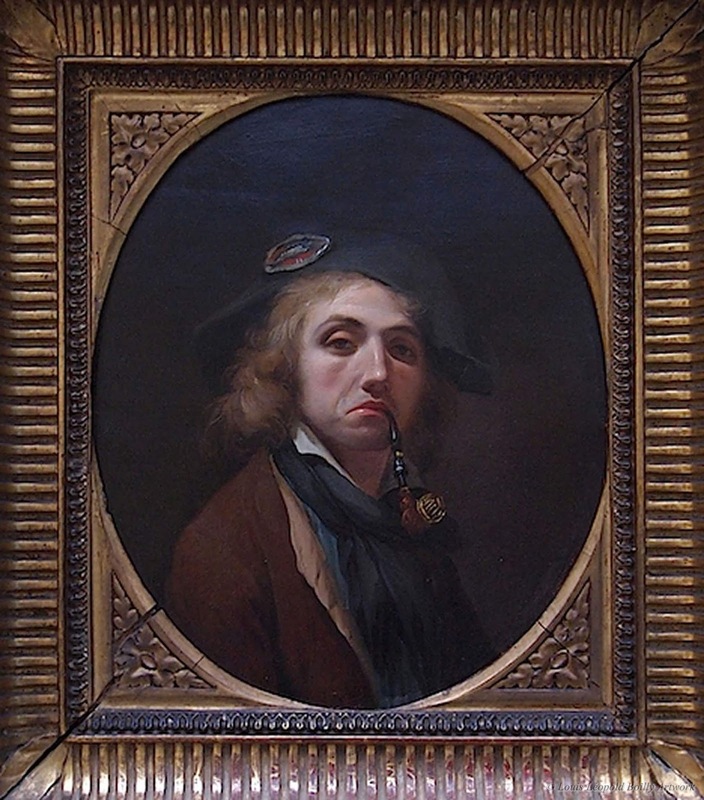 He often appears in Boilly's work where he is easily recognised by his long curly hair and bushy sideburns. 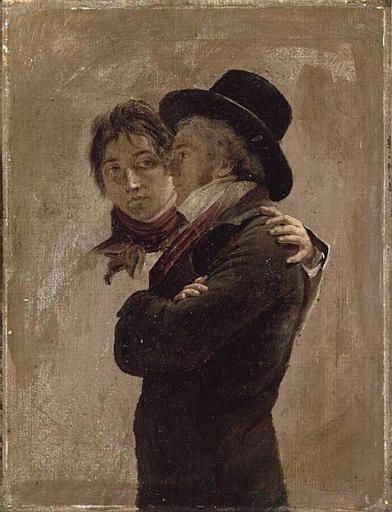 He features, for instance in the Reunion of Artists in Isabey's studio, where he stands next to Boilly himself. 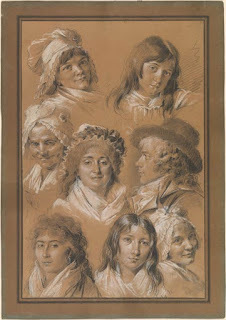 In the more relaxed political climate of 1799 Boilly produced as a gift for Chenard this whimsical self-portrait en sans-culotte, with a pendant portrait of his friend's mother as a woman of the people [See Siegfried, note.69: The pictures are labelled on the back, "Portrait de Boilly fait et donné/ à son ami Chenard l'an 1799" and "Portrait de la Bonne Mère de Chenard / fait et donné par Son Ami Boilly/ l'an 1799]. 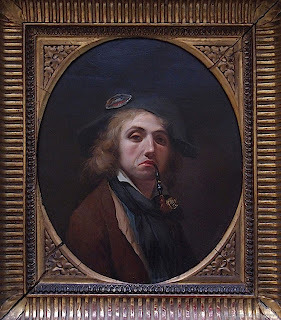 He also painted trompe-l'oeil versions in grisaille to mimic engravings behind broken glass. These latter are inscribed with dedications to Friendship (self-portrait) and to Nature (for Chenard's mother). The visual witticism is perhaps a reference to the 1792 painting: the ideal of the sans-culotte is faded and broken but personal friendship remains intact. Notice from the Musée Carnavalet.